Whether you’re a young student or a seasoned businessman, you have to make presentations. For that, you need PowerPoint templates. And if you can get them for free, that’s great, isn’t it. PowerPoint is the world’s most popular presentation making software application. Even though Google’s free app Slides has hampered PowerPoint’s popularity, but PowerPoint stays PowerPoint. However, you don’t have to worry. Whether you use PowerPoint or Google Slides these templates will work with both. That’s because Google Slides can open any PowerPoint file and can save any file into PPT format. Educational Powerpoint Templates: for students and teachers. Business Powerpoint Templates: for marketers, accountants and business management professionals. Creative Powerpoint Templates: for designers, advertising and creative professionals. Misc. : some pretty cool templates that don’t fit in the categories above. Guidelines: A pivotal list of guidelines for designing and formatting presentations. All of these are 100% free so feel free download as many as you’d like, and use them with Microsoft PowerPoint or Google Slides. Related Resource: If you are using MAC and want Keynote resources then fear not, just head over to our free collection of Keynote templates. This is a cute little template for KG school teachers. This PowerPoint template is designed for teaching the young ones and that’s why it makes use of music and animations. This is a neat template for students as well as teachers. The expression of this template is ideal for teachers who teach early grades. This widescreen fall themed template is designed for teachers who want to welcome their students and set their expectations about their course. This template is designed my Microsoft. This is a free PowerPoint background of a blackboard. It is ideal for school students as well as teachers. Sadly, it doesn’t contain any animations which I think would look pretty cool on a blackboard, but you can add them yourself. This template is designed to spread awareness about adult education. It is an ideal template for NGO workers and teachers working in developing countries for adult education. This is one of the educational PowerPoint backgrounds in this collection. It’s a simple background of a school homework book. This is a free PowerPoint background science students and teachers who need to make presentations on physics lessons. The image contains an atom illustration. This background is ideal for any kind of Math lessons. It is especially useful for Pythagoras presentations. I suppose this design is most appropriate for the final project of your school or college. This is ideal for teachers or educationists. It is ideal for conveying something related to study systems or teaching methods. This is another one from Microsoft. This template is designed for high school teachers, college professors, administrators, and others in education. This is an all purpose always-animated template for PowerPoint. If you are looking for a template that stays animated all the time, this is the one you’re looking for. Your audience sees an aerial view of an illustrated, fictional city in this presentation. This is another background offered free by Microsoft. This template is intended for marketers and management executives. I feel it can work with any business related presentation task. This Microsoft created template is ideal for pitching your project or explaining your project while it is undergoing. This is my favorite template by Microsoft. Why, because it is in pure black and white and I feel that creates a really dramatic effect. This is a clean and professional template designed to really communicate your ideas. I highly recommend this template. This is an ideal template for PR officers as well as bankers and anyone working in the finance industry. I really like this template because it adds a personal touch into the presentation. I love the hand sketched chalk board design. In my opinion, this is THE MOST BEAUTIFUL business template in this collection. I have nothing more to describe. This is pretty self explanatory I guess. You are seeing the horizontal red example but it is also available in vertical shape and in green color. This is reporting structure in a horizontal chart layout with hierarchy from left-to-right. This one is also available in pure white. 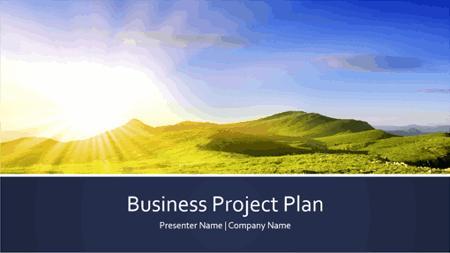 This presentation template contains a professional-grade profit and loss chart. This one uses a textured old paper background, Leonardo Da Vinci’s drawings and classic typography to convey a historical feeling. I’m not sure what is the ideal use for this template, but this is too cool to miss. This design gives a bold and modern look. Even though the design is fairly simple, the color scheme makes it more impactful than perhaps most PowerPoint templates listed here. This template contains a jolly, bold and lively design. You can keep the colorful palette, or recolor the circles in different tones. This is a color and happy looking presentation but make no mistake, it is a truly professional grade template and it is ideal to be used in business. I’m adding this presentation solely for one purpose: to present your portfolio and resume. This nifty PowerPoint template can be used almost anywhere. It can be used as an educational template, a business template or in almost any other category. That’s why I’m starting this miscellaneous section with this template. This is a timeline template with an infographic look. The flags really make it beautiful. This is a slick poster that can be customized and used for various other kinds of posters. I’m including this flyer template only because I don’t wanna miss anything, but if you are interested in them, do visit our collection of free flyer templates. This is an ideal way to present your wedding pictures, in an album as elegant as your wedding. This is a checklist for creating presentations that communicate your message. Consistency: Use the same font, colors and sizes (heading size, logo size, text size etc.) through out the presentation. This creates consistency, and this is very important. Less is more: it is very important to use smaller words and small amount of words. If you wanna write ‘large’, go for ‘big’ instead. If you wanna write ‘a very big’ then go for ‘huge’. Keep it brief, keep it concise. Simplify: it is always recommended that you use common words common phrases, unless you are sure that your audience will know the big words. You yellow? never use yellow color for text background. That’s a terrible design crime. Keep it tight on animations: even though they look cool, animations distract the audience. You must use them minimally and only in small scale. Try to avoid them altogether in content slides. One minute rule: The ideal amount of time for a slide is one minute. Switch early and audience gets distracted, even confused. Switch later and they start to get bored. Anything above two minutes and they might snooze off. Rehearse: if you have approach on the equipment where you will be presenting your slide, then test it on that equipment before the big day. No narration: do not speak your slides. You audience can read that. You need to add to your slides. Make your presentation accordingly. Storytelling structure: make sure that your presentation is following the proper storytelling structure: Introduction > Conflict (of interest statement) > Overview and Body > Resolution. That’s all the PowerPoint templates and presentation guidelines I had for you tonight. If you have anything to add to it, please use the comments section below. Your experience sharing can really help someone.